The report covers comprehensive information about market trends, volume (‘000 units) and value (US$ Mn) projections, market dynamics, competition, and recent developments in the target lead acid battery market for the study period 2014 to 2020. The target lead acid battery market is expected to reach a little over US$ 31,708.4 Bn by the end of forecast period, registering a CAGR of 4.6% for the period between 2014 and 2020. Advancements in the automobile industry, increasing adoption of electric cars, and the introduction of UPS power backups in industrial products are some of the factors expected to lay a robust foundation for the growth of the global lead acid battery market. A lead acid battery comprises four main elements: a positive plate, which is covered with a paste of lead dioxide; a negative plate made of sponge lead; a separator made of insulating material between the two plates, but allows the electrolyte and the ions into it to enable conduction without the two plates touching; and an electrolyte consisting of water and sulphuric acid. In terms of value, the Asia Pacific, Japan, Middle East & Africa, and Latin America lead acid battery market is anticipated to grow at a high CAGR over the forecast period 2014-20. During the past years, the world has witnessed a rising preference for electric vehicles. With the increasing electrification and modification in cars, the power requirement is increasing, especially for micro-hybrid and electric cars. This has led to the increasing preference for EFB and AGM batteries in Europe and America. The demand for AGM batteries in Europe and America is also rising due to the functional benefits of high cold cranking ampere (CCA) or AGM batteries. This need has called for the significant use of the lead acid battery. In terms of volume, the Asia Pacific, Japan, Middle East & Africa, and Latin America lead acid battery market is expected to grow at a CAGR of 3.9%, under an optimistic scenario. The transportation segment includes passenger cars and electric vehicles. This segment is likely to dominate the global lead acid battery market across all regions, owing to an increase in the production of electric and fuel vehicles. However, the stationary industrial segment is expected to grow at a high CAGR, owing to an increase in the demand from the telecom sector. Commercial and residential applications of lead acid battery are also expected to grow at a significant CAGR over the forecast period. Increasing marine activities and recreational boats are giving a trending opportunity for boats, which, in turn, is increasing the demand for lead acid battery. The SLI lead acid battery market is primarily driven by the consumer automotive segment, which is the largest revenue grosser. The lead acid battery demand is spurred by both, OE (original equipment) and aftermarket, which drives new sales as well as the replacement market. With improvements in the economy, automobile sales are booming, which is boding well for the SLI lead acid battery market, since SLI lead acid battery is the preferred choice for powering internal combustion engine-based automobiles. Therefore, the increasing demand for vehicles, will, in turn, increase the demand for lead acid battery. With fluctuating fuel prices and increasing regulations on carbon emissions, there is a rising preference for vehicles with high fuel efficiency. For instance, the emerging start-stop function technology uses a car battery to cut down fuel consumption when the car is in an idle state. A lead acid battery is comparatively economical as compared to nickel-metal hydride and lithium-ion type batteries, which are still in the development and commercialization phase. By application, the transportation application of the lead acid battery market has been identified as the leading segment, owing to its functional benefits as compared to other types of batteries. Increasing support from governments, coupled with strict emission norms are spurring the demand for electric vehicles, which, in turn, is expected increase the demand for lead acid battery. Japan is expected to exhibit a relatively higher CAGR than other regions in the lead acid battery market over the forecast period, owing to high preference towards electric vehicles and presence of prominent automotive manufacturers in this region. Also, a significant level of investments and industrial establishments leads to a high growth opportunity for the lead acid battery market. 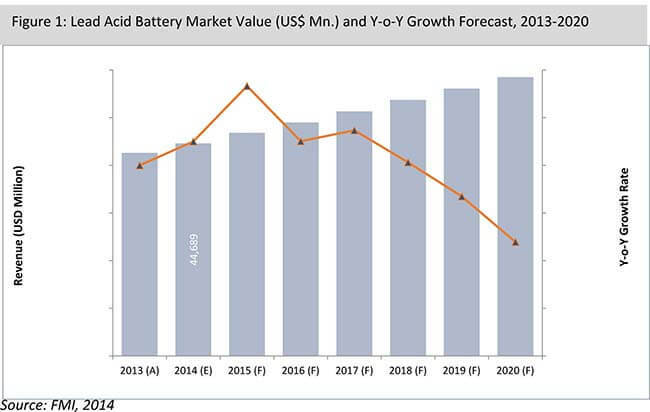 Asia Pacific is expected to register high growth rates in the lead acid battery market over the forecast period, owing to government initiatives to increase foreign direct investments in countries such as China and India, so as to increase manufacturing and the continuously expanding automotive industry, which is expected to support the growth of the lead acid battery market over the forecast period. The lead acid battery market is a highly competitive market, consisting of tier-1 global scale manufacturers, and a greater proportion of small-scale lead acid battery manufacturers catering to domestic demand. However, large industrial operations seek products from reputed lead acid battery manufacturers for demand procurement. Key strategies employed by tier-1 lead acid battery manufacturers include the provision of effective sales and services, strategic tie-ups with regional distributors/lead acid battery manufacturers to foray expansion in untapped markets of lead acid batttery, and undergoing restructuring business operations to optimize the use of resources. Lead acid battery manufacturers are also constantly focusing on the innovation and development of existing products that adhere to stringent environmental regulations, which is a factor that determines customer purchase preferences, as well as to cater to the growing customer demand for lead acid battery with enhanced charging efficiency, long life, etc. The advent of absorbent glass mat (AGM) lead acid battery, which are sealed units, is one such example of innovation. In 2014, Johnson Controls Inc. entered into a partnership with UW-Madison for battery innovation. In 2013, EnerSys Inc. acquired Purcell Systems Inc., which is a manufacturer, designer, and marketer of thermally managed electronic equipment and battery cabinets. This acquisition will enable EnerSys to expand its customer base. In March 2013, EnerSys Inc. announced plans to expand its new lead acid battery manufacturing facility in China. The company plans to produce industrial lead acid battery for local and international customers at this facility. In May 2013, GS Yuasa acquired a controlling interest in Siam GS Battery Co. Ltd. In 2013, GS Yuasa Corp. launched the ECO.R LONG LIFE series of lead acid battery for passenger cars. Some of the market participants involved in the production and sales of lead acid battery include Exide Technologies, EnerSys, GS Yuasa Corporation, Johnson Controls Inc., and Yokohama Industries. How has the lead acid battery market evolved in the past four years? What shape is the lead acid battery market expected to take in terms of volume and value during the study period? What are some of the prevailing market dynamics in the lead acid battery market? What are the competition developments and trends in the lead acid battery market? What are some of the underlying macro-economic and industry factors impacting the growth of the lead acid battery market? What are the important key challenges, opportunities, and improvement factors for lead acid battery market players? What are the important lead acid battery market positioning and key strategies of key manufacturers as per the market taxonomy? How is the competition structured at present, and how has it evolved in the lead acid battery market over the past few years? This FMI study offers an analysis and forecast of the global lead acid battery market for the period 2014 to 2020. The lead acid battery market study considers 2013 as the base year, with market values of lead acid battery estimated for the year 2014, and forecast developed for the duration between 2014 and 2020. Compound Annual Growth Rate (CAGR) has been calculated from 2014 to 2020. The study covers various perspectives of the lead acid battery market, including market dynamics, value chain, pricing analysis, competition analysis, regional and segmental growth comparison, and macro-economic and industry growth analysis, along with segment level projections, in a comprehensive manner. As per the findings of the study and perspectives of industry participants, the global lead acid battery market is projected to grow at a CAGR of 4.6% between 2014 and 2020, in terms of value. Growing disposable income, economic growth, industrial and technological developments, and the emerging automotive industry in developing economies are some of the factors positively impacting the consumption of lead acid battery in the Asia Pacific, Japan, Middle East & Africa, and Latin America market. The FMI report on the lead acid battery market carefully analyses the market on a global and regional level through market segmentation on the basis of key parameters such as country and application. The primary objective of the report is to offer key insights on the lead acid battery market updates, competition positioning, current trends, market potential, growth rates, and other relevant information and statistics in a suitable manner to the readers or various stakeholders of the lead acid battery market. A lead acid battery is a type of a battery that is used in various end uses, such as automobiles, UPS, power backup, etc. A lead acid battery also has operational benefits such as longer cycle life, low self-discharge, and comparatively lower cost than other battery types. The lead acid battery market report is structured in such a way that it will allow the reader to develop a thorough understanding of the market. The lead acid battery market report begins with the market introduction, which covers the market taxonomy and product definitions for the assessment of the target lead acid battery market. In the next section, the report describes the market development background of lead acid battery, and covers macro-economic factors, industry factors, forecast factors, regional weighted average pricing analysis of lead acid battery, value chain overview covering approximate margins, an indicative list of stakeholders involved in each stage, and an assessment of the lead acid battery market for the base year considered for the study. The next section of the lead acid battery market report discusses market dynamics such as the drivers, restraints, and trends impacting the market growth on a global level. The lead acid battery market opportunities or potential for manufacturers have been presented in the subsequent section of the same chapter. This section also includes the impact assessment of market dynamics on the global lead acid battery market on a qualitative level based on analysis facts and insights. Subsequent sections of the lead acid battery market report provide value (US$ Mn) and volume (Units) projections for the lead acid battery market on the basis of the aforementioned segments on a global level. The global lead acid battery market values represented in this section have been agglomerated by collecting data and information on a regional level. The lead acid battery market information, along with key facts and insights, cover unique analysis frameworks such as absolute $ opportunity analysis, year-on-year growth trend comparison, market share, and attractiveness analysis for each of the applications in covered in the segment. The next section of the lead acid battery market report presents a summarised view of the Asia Pacific, Japan, Middle East & Africa, and Latin America lead acid battery market based on four prominent regions considered in the study. The section includes the regional market position, growth potential, trends, and market attractiveness analysis for each of these regions. The lead acid battery market analysis sections cover Y-o-Y growth trends, market share analysis, market attractiveness, and incremental $ opportunity assessment for each of the aforementioned segment. These sections analyse the degree at which the market drivers are influencing the lead acid battery market in each region. In order to offer an accurate forecast, we started by sizing the current market, which forms the basis of how the global lead acid battery market is expected to develop in the future. Given the characteristics of the lead acid battery market, we triangulated the outcome of three different types of analysis based on primary research, secondary research, and our own analysis. However, forecasting the market in terms of various lead acid battery market segments and regions is more a matter of quantifying expectations and identifying opportunities rather than rationalising them after the completion of the forecasting exercise. In addition, it is imperative to note that, in an ever-fluctuating global economy, we not only conduct forecasts in terms of CAGR, but also analyse the market on the basis of key parameters, such as Year-on-Year (Y-o-Y) growth, to understand the predictability of the lead acid battery market and identify the right opportunities available. All the lead acid battery market segments, in terms of application and region, have been analysed on the basis of Basis Point Share (BPS) to understand each individual segment’s relative contribution to market growth. This detailed level of information is important for the identification of various key trends witnessed in the lead acid battery market. Another key feature of this report is the analysis of all the key segments in the lead acid battery market, and the regional adoption and revenue forecast in terms of absolute dollar opportunity. This is traditionally overlooked while forecasting the lead acid battery market; however, the absolute dollar opportunity is critical in assessing the level of opportunity that a provider can look to achieve, as well as to identify potential resources from a sales and delivery perspective in the lead acid battery market. In order to understand the key market segments in terms of the growth and consumption of lead acid battery across the concerned regions, FMI has developed an attractiveness index which will help providers identify real market opportunities. In the final section of the report, a competitive landscape of the lead acid battery market has been included to provide report audiences with a dashboard view, categorised on the basis of lead acid battery providers present in the value chain, their presence in the lead acid battery market, and key differentiating factors and strategies. The primary category of lead acid battery providers covered in the report is lead acid battery manufacturers. This section is primarily designed to provide clients with an objective and detailed comparative assessment of the key lead acid battery providers specific to a market segment in the value chain of the lead acid battery market. Report audiences can gain segment-specific vendor insights to identify and evaluate key competitors on the basis of in-depth assessment of their capabilities and success in the lead acid battery marketplace. Detailed profiles of the lead acid battery providers have also been included under the scope of the lead acid battery report, to evaluate their long- and short-term strategies, key offerings, and recent developments pertaining to the lead acid battery market. Examples of some of the key competitors covered in the lead acid battery market report include Exide Technologies, EnerSys, GS Yuasa Corporation, Johnson Controls Inc., and Yokohama Industries.